Taking the lane keeps things safe on the ride. The main factor for me in whether or not to take the lane is whether I feel that there is safe clearance for both me and the inevitable passing cars. If there is room for all I will stay in the secondary rising position. If I feel I will get squeezed when car drivers pass due to a narrow lane, I will take the lane. Drivers may see this as a bicyclist being obstructionist or obstinate. I am not sure. All I know is I want to get to the movies safely and not become a road accident. Right turn lanes complicate this situation for the bicyclist since passing cars have built up speed and here I go moving out into their travel lane. Car drivers at stoplights are generally rarin' to take off when they get the green light. With me in the primary riding position and upon the light turning green drivers who have stacked up behind me on my bike must wait until enough lane width exists for them to safely pass. *Thanks to Lisa for showing me confidence to be consistent in my pedaling. And for going with me to see a funny movie on a schoolnight. Columbia, Missouri's Gina Overshiner is a hands-on mom. And a mom who bikes. When her two kids Max and Anna Rose started attending different local schools Gina opted not to get a mini-van with room for the whole soccer team. Instead, she did what any mid-western mom with a passion for active transportation did: she started a bike brigade. Every school day, Gina rides with Max to Columbia's Smithton Middle School. On the way to school, Gina and Max stop at Again Street Park. There they pick up any other neighborhood kid who wants to ride. 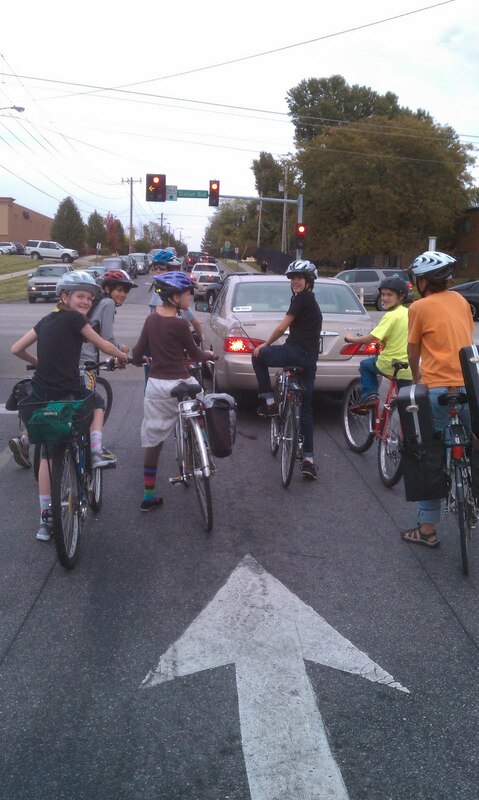 The kids and their parents like the safety that riding as a group offers (Ask a generally solitary rider about the power of riding with one, ten or a hundred other bicyclists. It changes things.) After navigating west-central Columbia's mix of local roads and a state highway, a regional commercial hub and the ubiquitous hills, Gina and her Smithton Bike Brigade arrive at school. "The Smithton Bike Brigade offers an opportunity for social engagement around bike activities," says Gina. "I am always thinking about new ways to get more kids involved. Besides being a social activity with a workout attached the Brigade fosters community and encourages social activism among these students." Recently, the students heard about Zambikes, a not-for-profit that provides bicycle ambulances to villages in Zambia. With a population of about 12 million in an area the size of Texas, Zambia lies in Sub-Saharan Africa. Motor vehicles are scarce in rural Zambia and a bicycle is one way to easily connect Zambians who needs medical attention with providers who are often separated by large distances. 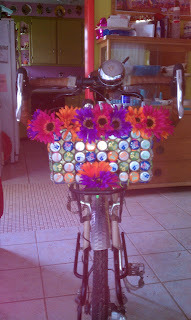 With their interest in supporting bicycling in Zambia, the students (with some help from Gina) created a fundraiser. They operated a Bike Spa at Columbia's 2011 Earth Day Festival. Riders paid $10 for the students to clean their rides’ chains and apply needed lube, check the brakes and tire pressure. The bike spa profits went to Zambikes to buy a bike ambulance. Gina notes "These kids understand and appreciate the need to get political about bicycling. 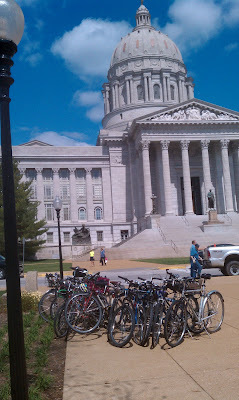 We took them to Jefferson City this Spring to talk to legislators on Bike/Ped Day at the Capitol. 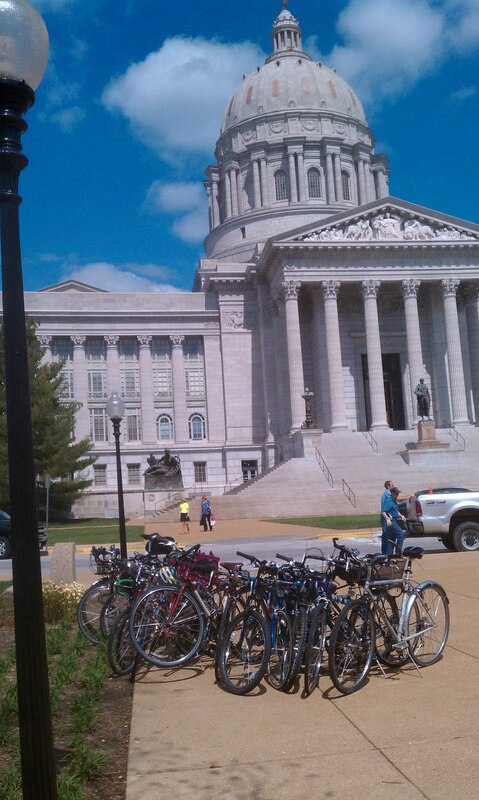 The elected officials were impressed when a bunch of sixth-graders shared information with them about bike safety." Also politically active on the local level, the bike brigade continues to work with the City of Columbia staff to improve bike and pedestrian facilities at a major intersection near Smithton Middle School. As Education Coordinator for the PedNet Coalition, Gina sees all this as part of her job. "The bike brigade is an experiment," she adds. "I am trying to find our what the kids respond to." And after Gina gets done riding Max and his fellow members of the Bike Brigade to Smithton, Gina turns around and rides home, picks up AnnaRose on her bike and accompanies her to school in the other direction. What folks are wearing out on those Livable Streets. There are a lot of factors that go into making a decision. Whether it is where to eat dinner, who to take to the prom or when to invest. Recent research from University of Missouri researchers indicate that advocates for physical activity may find the greatest success when they reinforce good behaviors that leads to exercise instead of trying to give people still more information about why they need to exercise. In the case of physical activity, more information may not be better. Some support at the right time and place may make all the difference. Once you have made the decision to walk or bicycle to some of your destinations, clothes make the (wo)man. If you are trying active transportation for the first time consider investing in clothing that will keep you dry and warm. Ankle biters: These sound painful but are not. Ankle biters are a piece of metal or a velcro strip that cinches around your ankle that rides on the chain side of the bicycle. You only have to trash a pair of pants once by getting them caught in your bike chain before you go looking for an ankle biter. No bike shop near you? No worries. A burly rubber band works fine, too. Shoes: As a walker, you deserve good footwear. Solid support coupled with waterproof or wicking fibers will keep your pups dry and warm in all kinds of weather. A change of shoes upon arrival lets you slip into something more comfortable in which to have your day. And TODAY is YOUR day, right? There. Is your wardrobe completely prepared for any kind of weather? Let me know what key accountrements for the well-dressed active commuter I may have missed.